Click here to sign the petition by Solar Done Right calling for a responsible renewable energy future. We have a long history of destroying wild landscapes to generate electricity. Oil spills killing marine life, natural gas wells fragmenting sagebrush habitat and spoiling our groundwater, and coal plants spewing emissions that warm our planet. We are rightfully looking to renewable energy sources as a better alternative, but we cannot afford to sacrifice more wildlands to energy. As of December, the Bureau of Land Management had received applications for wind and solar facilities on 1,659 square miles of public land in just California, and yet that would still not be enough to meet the State's energy needs. We need a responsible renewable energy policy that prioritizes distributed generation (e.g. rooftop solar), energy conservation, and placing the larger facilities on already-disturbed lands. Basin and Range Watch members met with officials from the Bureau of Land Management's California and Nevada state offices earlier this month to present the proposed Ivanpah Area of Critical Environmental Concern (ACEC), which is also supported by the Desert Tortoise Council and Desert Protective Council. 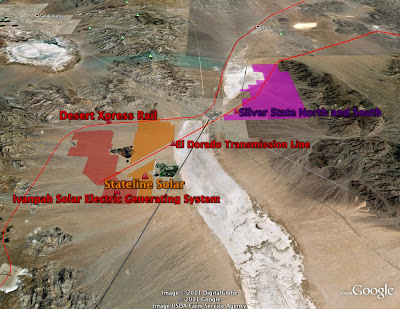 The ACEC is needed to protect biological and cultural resources that would be imperiled by additional solar energy development in the Ivanpah Valley, including a connectivity corridor for the endangered desert tortoise. 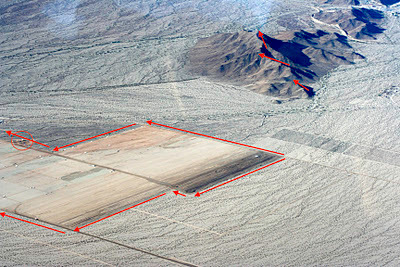 As human-induced climate change challenges desert ecosystems, the genetic connectivity and healthy habitat offered by the Ivanpah Valley will be critical to the survival of many desert species. How Much Land Will We Industrialize? As of December, the Bureau of Land Management had approved or received applications for utility-scale solar and wind energy facilities on 1,659 square miles of public land in California. These projects are massive in scale, requiring tons of steel and concrete, and the bulldozing of ecologically intact lands. Yet if all of the proposals are built they will provide less than half of California's energy demand. Similar levels of destruction will have to take place in other states to meet their energy demand. It is hard to imagine all of these beautiful landscapes being destroyed in the name of "green" energy, especially when we have enough rooftops, parking lots, and other brownfields in our cities to support solar panels. What would you rather find beyond coal? Rooftop solar or industrial destruction of our landscapes? Just how big is 1,659 square miles? The red shaded boxes in the Google maps below each show an area 1,659 square miles in size. No energy source is without its impacts, but considering how much steel and concrete is needed to construct utility-scale solar and wind facilities, we may be adding more greenhouse gas emissions than necessary. When most people in the United States think about clean energy, they picture facilities that are inherently not green -- solar facilities in the desert or gigantic wind turbines on hillsides tethered to our cities by hundreds of miles of costly transmission lines. These industrial facilities require amounts of materials and construction processes that make them unsustainable choices to replace dirty coal. When it comes to clean energy, nothing beats the efficiency and "green" of distributed energy, such as solar panels on rooftops or over parking lots, which require less of the materials that require carbon emissions to produce and transport. Not long after I started this blog I came across a photographers amazing catch of a Geminid meteor streaking across the Mojave Desert's night sky in 2009. The photograph was taken in 2009, and can be viewed at this link. A year later, a videographer captured some amazing scenes of the Geminid meteor shower over America's desert landscapes, including Joshua Tree National Park. Fleeting Light: The High Desert and the Geminid Meteor Shower from Henry Jun Wah Lee on Vimeo. The BLM later this month may release a preliminary environmental impact review for Duke Energy's proposed wind project near Searchlight, Nevada, according to Basin and Range Watch. The project's monstrous proportions would industrialize 38 square miles of desert landscapes with up to 140 wind turbines. Each turbine would be over 400 feet tall -- that is over 100 feet taller than the Statue of Liberty. The turbines would pose a threat to hawks, eagles and other bird life in the area, and would require miles of new roads etched into the valleys and hillsides. You can find beautiful photos of the area, including wildlife and landscapes, at this website put up by Basin and Range Watch. I have never met Carl Zichella of the Natural Resources Defense Council (NRDC), but I'm sure he has a history of standing up for what's right for our environment. But after reading the Desert Sun article on the Department of Interior's plans to allow solar energy companies to bulldoze hundreds of square miles of desert wildlands, I'm convinced Mr. Zichella got lost somewhere on his journey. The Los Angeles Times published an article on the passing of long time desert conservationist Elden Hughes. He worked with others in the Sierra Club to advocate for the California Desert Protection Act in the early nineties, and supported the Wildlands Conservancy's purchase and protection of hundreds of thousands of acres in the Mojave Desert, which are now at the center of new desert legislation. 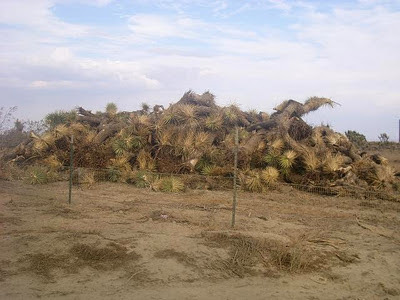 More recently he brought attention to the destruction of desert habitat by large solar facilities. 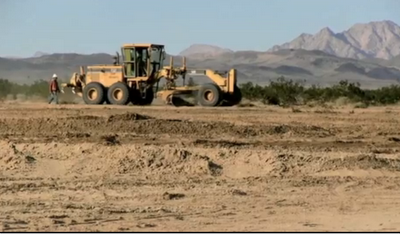 Mr. Hughes spoke up against BrightSource Energy's Ivanpah Solar Electric Generating System. He was no stranger to Ivanpah. In 1998 he brought attention to destructive plans to build an airport in the remote desert valley to serve the ever-expanding Las Vegas. With over 1,000 square miles of destructive renewable energy projects proposed for public lands in California -- mostly in the Mojave and Colorado Deserts -- the California Desert Protection Act of 2011 (CDPA 2011, S.138) appears to be the most extensive proposal to spare desert lands from the prospect of unnecessary industrial development. Senator Dianne Feinstein actually first proposed the legislation in 2010, but Congress was mired in protracted debate on other issues that year, including health care legislation and last minute deals to put in place a stop-gap budget deal. Feinstein reintroduced CDPA in January this year, but we are days away from the end of another legislative calendar and the bill still has not moved beyond the Senate Committee on Energy and Natural Resources, and Congress is still deadlocked on spending issues. Tomorrow is 20 November. A community group called Solar Mosaic declared 20 November as Occupy Rooftops day. Meaning, find the rooftop of a building in your community where you would like to see rooftop solar, take a picture and send it to Solar Mosaic. The organization has already used "crowdfunding" to install solar on the rooftop of a community building in Oakland, and is now raising community investment to install solar on other buildings in Oakland and Flagstaff. (I sponsored a solar tile at an Oakland-based food justice organization). Solar Mosaic is a small slice of the rooftop solar pie, but one that is emblematic of how distributed generation -- also known as local clean energy -- can cut greenhouse gasses without asking giant utility companies to devastate desert habitat or mountaintops for big solar and wind projects that are hundreds of miles away from our cities. An excellent op-ed published in the Sacramento Bee explains what California should do to encourage rooftop solar and other forms of local clean energy. At the heart of the debate is the San Diego Gas & Electric company's proposal to charge rooftop solar owners a superfluous "transmission" charge. You can think of this as equivalent to Bank of America's ridiculous plan to charge its customers $5 a month to use their debit cards. Solar technology makes utility companies seem as outdated as record companies and paperback book publishers in an age of MP3s and Amazon Kindles. Even Bloomberg agrees. Solar gives everyone the opportunity to generate their own energy. 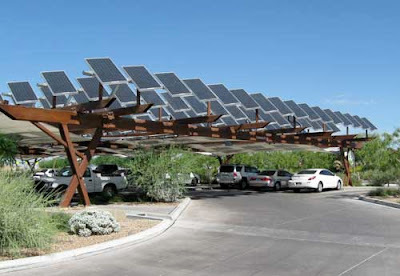 No need to bulldoze deserts for solar facilities. 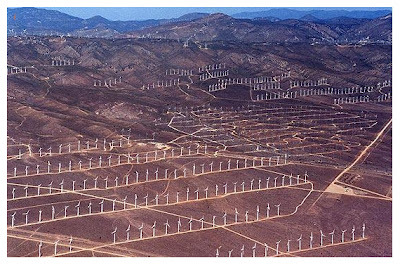 No need to install wind turbines on beautiful mountains. No need to blast open mountains in West Virginia for coal. It's time that the California Public Utilities Commission appreciate the true value of rooftop solar. Wind turbines are not green, and the video below shows the ugly side to this utility-scale energy behemoth that is altering thousands of square miles across the country. Not only do they require massive amounts of steel to produce, they are transported by diesel guzzling trucks for hundreds of miles, tons of concrete is needed to pour their foundations, and wide access roads are bulldozed into the land and mountain ridges where they are installed. Once the blades are spinning, they become a huge threat to rare wildlife, such as golden eagles, hawks, owls, bats, sandhill cranes, etc. Research indicates that at least 440,000 birds are killed each year by wind turbines, and that number is expected to climb to 1,000,000 per year by 2030 as more wind facilities are constructed. The video below shows scenes of destruction in Vermont as a mountain ridgeline is blasted away to make way for wind turbines. This is Green Energy? from Catamount on Vimeo. Before BrightSource Energy could begin bulldozing 5.6 square miles of ecologically intact desert habitat, Secretary of Interior had to sign a record of decision approving the project's use of public land and resources. 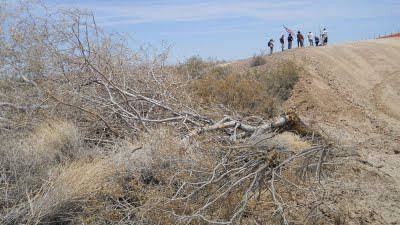 Department of Interior ignored its responsibility to act as a responsible steward of public lands, and instead catered to BrightSource Energy's desire to build the project on some of the most important habitat for the threatened desert tortoise, despite calls for the government agency and solar company to consider alternative locations. Your government knew this was the case, but approved the energy facility anyways. Thousands of protesters plan to encircle the White House this weekend to speak up against the destructive Keystone pipeline, which would pump hundreds of thousands of barrels of tar sands oil into the US from Canada. Opposition to the Keystone pipeline echoes themes in the Occupy Wall Street movement, which opposes the government's catering to the needs of Corporations at the expense of the public's well-being. The truest form of energy independence -- loosening the grip of massive utility companies and Wall Street backed energy firms -- comes in the form of distributed generation, such as rooftop solar. And Solar Mosaic, an innovative marketplace that brings community donations to local solar installations, is sponsoring Community Solar Day on 20 November, asking communities to identity rooftops they want to occupy with solar panels.